The levator scapula is a small banded muscle responsible for upperward rotation of the shoulder blade during arm function. 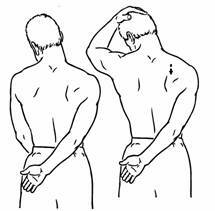 However, this muscle is usually very tight and full of trigger points due the modern lifestyle and poor posture. Stretching this muscle can decrease headaches, trigger points, sore neck & shoulders, and even prevent repetitive injuries. 1. Place your right arm behind you. 2. Tilt and turn your head to your left. 3. Gently nod your head forward. You should feel a stretch on the right side and back of your neck. 4. Bring your left hand over the top of your head and pull gently leftward and downward. 5. Hold this position for 30 seconds and take slow deep breaths. 6. Reverse the directions to stretch your left side. Remember, stretches must be held for at LEAST 30 seconds to create physiological change. This takes a minute of your time to stretch both sides of your neck. Doing this stretch every hour will absolutely change the way your neck and shoulders feel on a day to day basis.